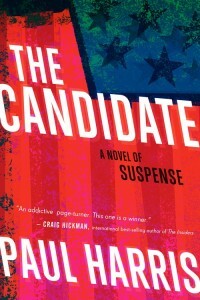 Recommended for people looking for an "airplane read"
On a freezing winter's night in Iowa, jack Hodges, a little-known U.S. presidential candidate, knows his campaign is on its last legs. As he speaks at a rally a shot rings out. He survives the attempt on his life, but the incident finally propels Hodges on to the front pages. Police arrest the would-be assassin, but she refuses to say a single word. Her name, age, even her nationality, remain a mystery. Guided by his outspoken campaign manager, Dee Babineaux, Hodges' campaign seizes its chance and soon electrifies the nation. But Babineaux knows it is vital to discover the identity of the mysterious assassin. That task falls to Mike Sweeney, a true believer in Hodges' cause, who must find out her past before anyone from a rival campaign or the media does. Sweeney's journey uncovers more and more disturbing information, but at the same time Hodges' campaign, guided by the ruthless, dark genius of Babineaux, galanizes voters. But one devastating secret could destroy it all. I will admit to being sort of a political junk and, frankly, I really like watching presidential elections. I was excited to read this book, knowing it was written by a journalist who has followed elections in the past--including the race between Barack Obama and Hillary Clinton in the 2008 primaries. My first impression of this book is that it reminded me, quite a bit, of Primary Colors. While some similarities are to be expected--both books take place during the same point of the election cycle, both books were written by people who followed Hillary Clinton--others were unexpected. There are a few characters--Dee Babineaux, for one--who feel like they are characters in both books. Harris was successful in pacing his plot and tying up loose ends. He is very good at planting enough clues, but some of the clues probably should have been planted deeper. I knew how the book would end once I hit about the halfway point. Harris mixes reality with fiction here. Harriet Stanton, Jack Hodges' opponent, is unquestionably Hillary Clinton. However, Jack Hodges' doesn't bear any resemblance to Barack Obama. Bush, Clinton and McCain are all mentioned, but then there is Jack Hodges', who appears not to be based on any real figure. After all I said, I will admit that this sounds like a negative review. But here's the thing--despite everything, I found this to be an incredibly fun book to read. The mixing of fact and fiction not only didn't bother me, but it kept me guessing. Even though I figured out how the book would end, I was still interested to see how it got there. This is a novel that I would call an "airplane book." It's completely entertaining, but not something you need to, or should, think too hard about. I would recommend it to others based on pure entertainment value! September 10 - Peppermint Ph.D. I read Harris' previous book, THE SECRET KEEPER, a while back and really enjoyed his style. I'm definitely looking forward to reading this one! I haven't read Primary Colors but probably need to :) I agree with you that this was a fast (beach) read, and I too figured out what was going to happen pretty quickly. I would have liked to see more depth in many of the characters as well.